Wildfire is one of nature's most volatile forces, and it is a staple of broadcast news every fire season. For decades, films and television shows have also told compelling stories associated with wildfires and firefighting. NIFC is an active partner with production companies in telling these stories. 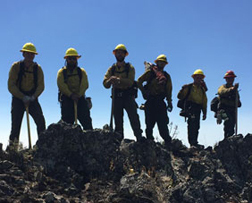 This guide is intended to provide basic information on the policies and processes followed by NIFC in considering proposals to use federal firefighting crews, incident management teams and wildland fire equipment in a documentary film or television series production. Producers with proposals or ideas in the genres of documentary film, docu-series, and reality television will find valuable information on this site.